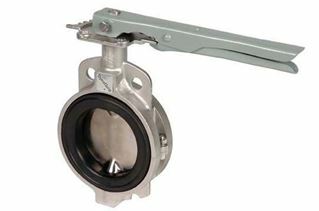 DynaQuip 890/892 Series butterfly valves are designed for specialized or severe service. Built for high demand applications in the food and beverage, chemical/petro chemical, processing, power and utilities, pulp/ paper markets, etc., these valves offer years of performance for a wide range of applications. This valve can be automated – contact us for details. For application and ordering information, please contact us. Body - Lug style has drilled and tapped lugs meeting ANSI 125/150 flange standards. Two piece body allows ease of seat replacement. Lug body standard with ductile iron. Wafer body standard with ductile iron. Also available in aluminum and stainless steel. Disc/Stem - The one-piece disc/stem is manufactured as standard in grade 255 stainless steel. Type 255 stainless has almost twice the strength of type 316 stainless steel. This eliminates shaft twisting and water hammer damage while allowing a thin disc design that increases CV ratings. Type 255 stainless provides four times the corrosion resistance as 316 stainless steel. The disc can be encapsulated with various rubber compounds and other chemically compatible materials. Undercut disc for dry powder applications are also available. Top Plate Standard ISO 5211 – Accommodates handles, gear operators, electric and pneumatic actuators. Seat - The seat fully encapsulates the valve body, thereby preventing corrosion of the body or contamination of the flowing product. The only wetted parts are the seat and disc. Seats are available in EPDM (food grade), black nitrile (food grade), PTFE/Buna-N, PTFE/EPDM, Silicone, and Viton®. Stem Bushing - Composed of full strength, corrosion resistant ertalyte, stem bushings absorb operator side thrust. Top bushing comes standard in all valves, while bottom bushing comes with all valves sizes 4"-12". Stem-Seal - A third seal ensuring leak resistance externally or internally for vacuum or pressure service. Matches seat materials: Buna-N, EPDM, or Viton®. O-Seal - Two O-seals give a sure secondary seal as the O-seal becomes part of the body and encircles the stem before entering the seat and disc area. O-seals are also located at top and bottom of stem entry to form an absolute secondary seal. Seals are of the same material except for silicone. Hub Seal or Primary Seal - Occurs when contact is made between the disc hub and the flat surface of the seat. Hub/seat seals prevent product from attacking stem or body. Flange Seal - Sealing O-ring of resilient seat which provides an absolute seal to all flanges within specifications. No other gaskets required.